I could list a thousand reasons why Bishop rocks. It’s stunningly beautiful. The mountains are majestic. The high desert is surreal. The climate is wonderful. There are scores of world-class outdoor activities to be enjoyed. The city is small and attractive. The community is vibrant. The people are friendly. There is art, music and culture to be enjoyed. There is a wonderful selection of restaurants serving quality food. Options for accommodation range from dispersed, free camping, and full service campgrounds, to hostels, and high-end motels and hotels. So why 6½ reasons for why Bishop rocks? That’s because this is about the real rock and the real rock stars (of a different sort) that make Bishop the best bouldering and one of the best rock climbing venues in the world. 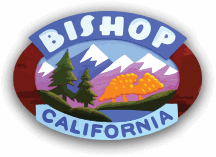 Whether you’re a seasoned pro or a beginner climber, Bishop is the perfect place to develop and hone your climbing skills. Here’s a concise list of places to go and people to talk to about improving or beginning your quest as a climber. Plus, as with most sports, climbing has a language of its own and I’ve included a short glossary of terms and a link to more. 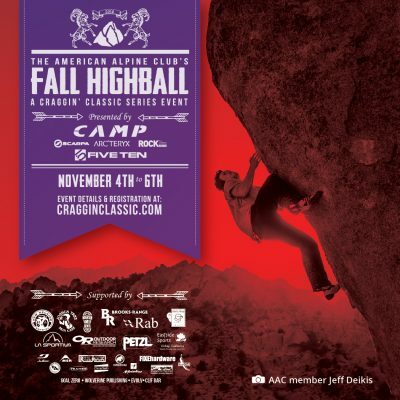 Finally, and you really don’t want to miss this if you’re a wanna-be rock star, The Fall Highball Craggin’ Classic returns to Bishop, November 4th – 6th. Buttermilk Country is fondly called the “Buttermilks” or simply the “Milks” by climbers and is considered by many to be the best bouldering area in the country. 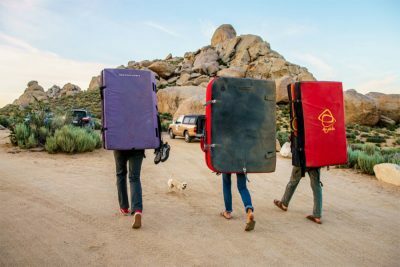 It is certainly California’s premier bouldering spot and entices some of the world-renowned heroes of climbing, like Kevin Jorgensen, a frequent winter boulderer who works on bouldering problems* during his off-season from big wall climbing. The boulders here are known as glacial erratics. Huge rocks plucked from the Sierra Nevada 4 miles away, some 2.5 million years ago. 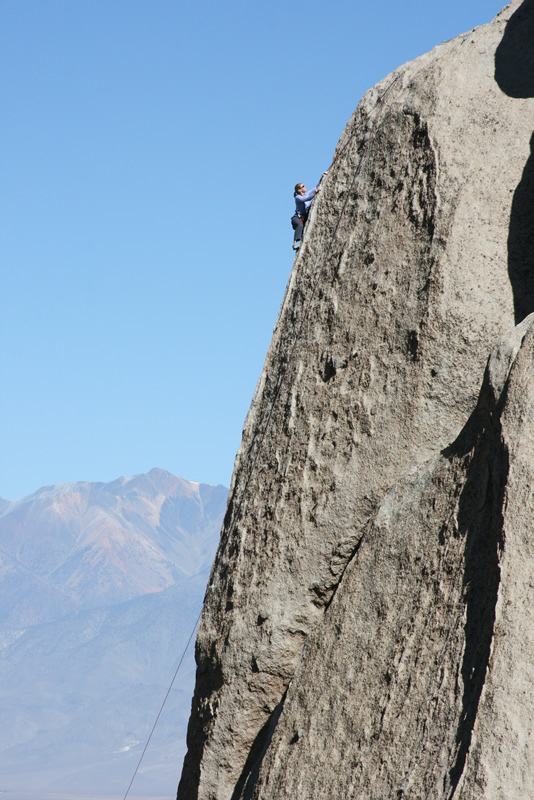 The Buttermilks boast some of the largest erratics anywhere, with boulders more than 40 feet tall. 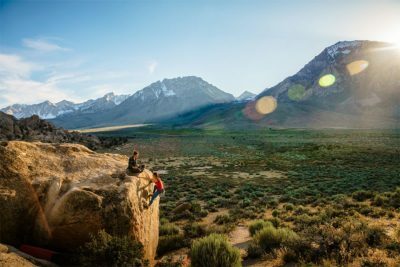 The Buttermilks, however, are not just for experienced climbers and there are numerous smaller rocks where kids and the young-at-heart can experience scrambling and begin to get the feel of rock climbing. Getting to the Milks is a short 20 minute drive west of Bishop. Head west on Highway 168 (W. Line St.) for 13 miles to the junction of Buttermilk Rd and turn right. The road turns to gravel just beyond the cattle guard and 12 miles further you will find yourself in the heart of Buttermilk County. The Owens River Gorge is a deep, steep-sided canyon about 10 miles long located northwest of Bishop. It is a favorite destination for sport climbing* for beginners and experienced climbers alike. Beginners are, however, encouraged to join a group that has a reasonable amount of sport climbing experience and the right equipment. Sport climbing is characterized by the use of permanent protection bolted in the rock. With a climbing rope, and a partner to belay* the climber, the risks are minimized and the climb can be a fun and satisfying challenge. About 760,000 years ago the Long Valley Caldera near Lake Crowley formed when a massive volcanic eruption emptied the magma chamber below and released a very hot ash that subsequently cooled and hardened into the rock we now call Bishop Tuff. Later the Owens River slowly cut the deep gorge and exposed the layers of tuff with perfectly incut handholds. Climbing in the Gorge is best during the cooler months from late fall through spring. There are two good routes to access the most popular stretches of wall and both involve a short hike – one by road, which is closed to vehicle traffic, and the other a steep scramble down a rocky gully with roughly built steps that is maintained by the local climbing community. A drive of about 12 miles from Bishop north on US Highway 395, then a further 5 miles along Gorge Rd will get you to the parking areas for these trails. 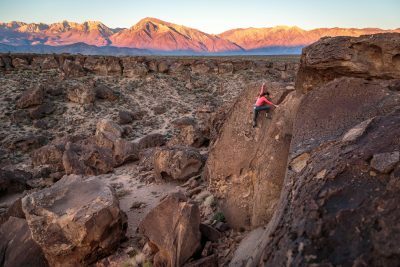 Just 10 minutes north of Bishop, at the southern edge of the 300-foot high volcanic tablelandsare numerous washes filled with perfect boulders. 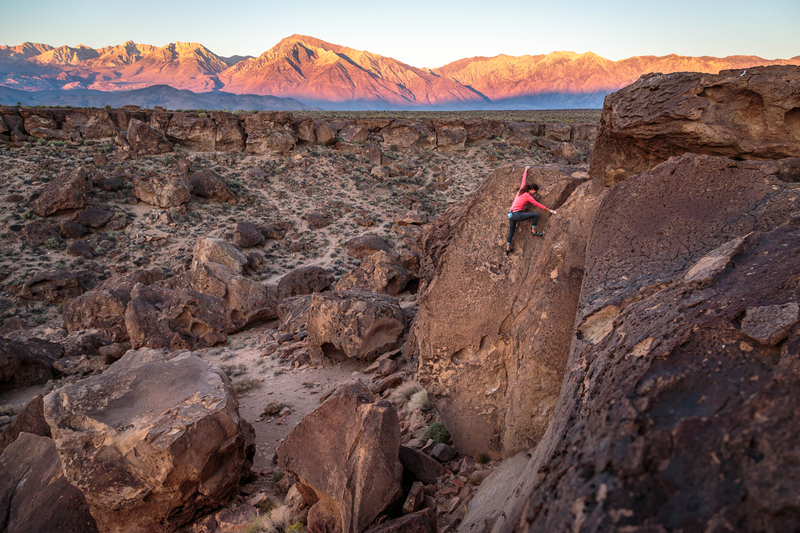 The Bishop Tuff has been sculpted, cracked and pockmarked to provide an endless variety of bouldering opportunities. 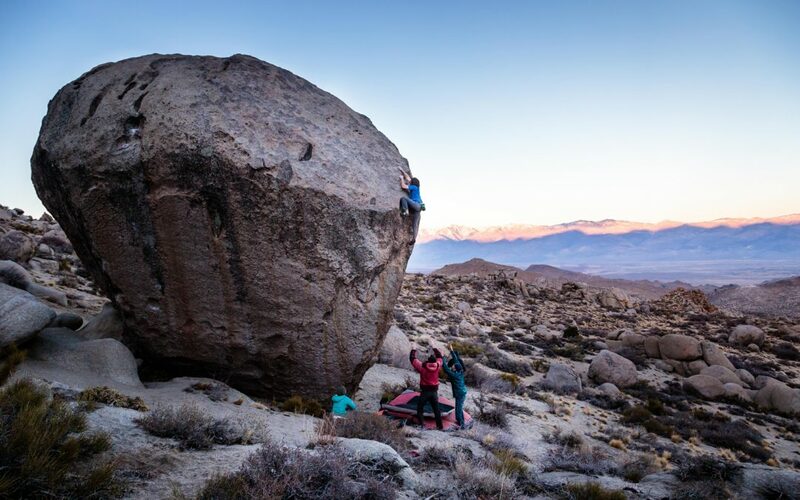 The Happy Boulders offer more warmth and shelter from the wind on blustery winter days than the exposed boulders of the Buttermilks, and the Sads can be perfect on hot days due the narrow, catacomb-like channel. A short, but fairly steep trail leads into each canyon and the views out across the valley toward the towering Sierra Nevada are awe-inspiring. Climbing on the tablelands offers physical climbing on positive holds, a perfect transition from gym climbing to the outdoors. The drive along Chalk Bluff road at the base of the plateau to the parking areas at the mouth of each wash is quite spectacular in itself. Just below the road level, the Owens River winds its way out across the valley floor and is popular with year round fisherpeople and bird watchers. If the Happies are the warmer winter alternative to the Buttermilks, the Druid Stones are the cooler summer alternative. Two thousand feet above Bishop this large collection of big monzonite boulders is home to hundreds of boulder problems. It’s an uphill hike to reach the spot and along the way you may be tempted to stop and drop a pad* and just climb the nearest rock. Persevere. You will be rewarded. The view alone is worth the hike. High quality climbing identical to the Buttermilks will be found, but without the crowds. Getting to the trailhead is a short drive out of Bishop along S. Barlow Lane, bear right at the fork up Bir Rd and in 1.7 miles look for a sandy dual-track road to your left. Follow the track toward the base of the hill and park at the road’s end. A Google Map search of Druid Parking, Bir Road will pinpoint the spot. This classic example of a deep glacial canyon is Bishop’s best offer of summer granite climbing. It has a long and proud history of climbing greats who have put up classic and technically challenging routes. The canyon continues to be developed as a sport climbing area and a neo trad* mecca with crack climbs that are interspersed with the bolted sport routes. Pine Creek Canyon is popular with the experienced local climbers and a summer destination. Paved roads from Bishop along US Highway 395 north then west along Pine Creek road make reaching this hidden gem an easy 20 minute drive. The Tungsten mining history of Pine Creek Canyon is as fascinating as the climbing and a trip to the end of the canyon shows an intriguing glimpse of a time gone by. Bishop Creek Canyon is the jewel in the crown of Bishop’s outdoor activities. It is the nearest gateway to the John Muir and Pacific Crest Trails. It offers world-class fishing, hiking and mountain biking in summer, snowshoeing and cross country skiing in winter, and the most magnificent fall colors in autumn. The roads are eminently suitable for road cycling, motorcycles, and auto touring. There are campgrounds galore and the lodges are quaint and picturesque. Climbing here is a mixed bag of alpine routes and summer cragging. Remember this area when the warm weather returns next year and you’re looking for cool and quiet and something new. Little Egypt sits on the edge of the mountainside overlooking Bishop, Buttermilk Country, the Volcanic Tablelands, and out across the valley toward the White Mountains. It has a commanding view, but the rock will command your attention once you begin your ascent. There is a combination of sport and trad routes here and it is considered some of the best crack climbing* in the area. Near the head of Bishop Creek’s middle fork, opposite Cardinal Lodge is Cardinal Pinnacle, an immaculate white granite crag rising almost 500 feet from its talus slopes. The approach is rough and the routes are exposed trad classics. Wild Rose Buttress is a white granite crag just before the South Lake dam. It is so named for the wild and thorny rosebushes that grow at the base of the crag. It has a small mix of sport and trad and does not see much action. Sabrina Basin Bouldering is another less frequented climbing spot. It’s 4 miles into the John Muir Wilderness from Sabrina Lake parking and sits at an elevation of 10,400’. So it’s really just a good excuse to bring your climbing shoes along when you go for a hike. All good partnerships are two halves of a whole. 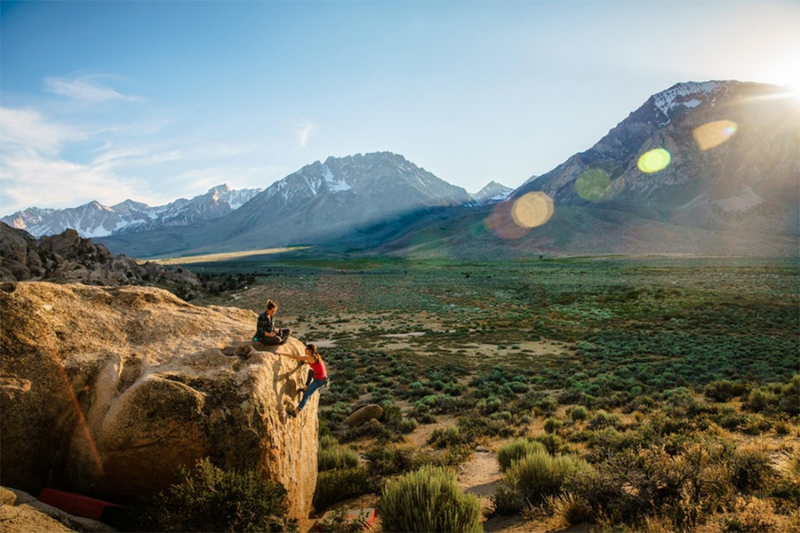 So it is that the opportunities for rock climbing and bouldering in Bishop are balanced by the services provided by local guide companies and outdoor retailers. The first half of adventure is in the preparation. Climbing is a sport that requires knowledge, basic training and some specialized gear. Bishop is home to many top-level climbers and highly experienced guides. Sure it’s possible to start bouldering with little more than a pair of climbing shoes and a chalk bag, but to make progress safely it is best to understand and learn the fundamentals of technique. Starting out with sport or trad climbing absolutely requires the assistance of an experienced climber/guide. Beginner courses are offered by a number of qualified and certified training centers. 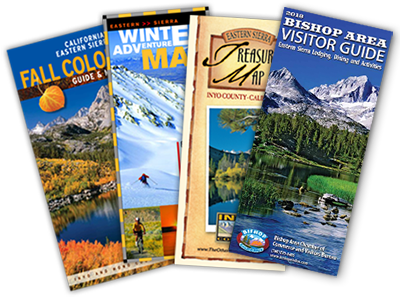 Highly knowledgeable, experienced and friendly outdoor enthusiasts staff the local outdoor retailers and they’re always willing to share their love of the Bishop area. Check out these links to services and retailers who can get you started (or take you to the next level) of your climbing adventure. A short list of climbing slang used in this article. To protect a roped climber from falling by passing the rope through a type of friction enhancing device. Before belay devices were invented, the rope was simply passed around the belayer’s hips to create friction. To ascend on a rock face by wedging body parts into cracks usually requires “gear” (aka protection). A thick foam mat used to soften landings or to cover hazardous objects in the event of a bouldering fall. The path that a climber must “solve” to complete a boulder ascent. A style of climbing where form, technical (or gymnastic) ability and strength are emphasized over exploration, self-reliance and the exhilaration of the inherent dangers involved in the sport. Sport climbing, routes tend to be well protected with pre-placed bolt-anchors and lends themselves to athletic climbing. A style of climbing that emphasizes the adventure and exploratory nature of climbing. While sport climbers generally will use pre-placed protection (“bolts”), traditional (or “trad”) climbers will place their own protection as they climb, generally carried with them on a rack. There’s no better place to begin or develop your climbing skills than right here, right now. The second annual Flash Foxy festival will take place March 3-5, 2017 right here in Bishop. This badass festival brings veteran female climbers and beginner climbers together to experience and celebrate the magic of women climbing with women. The Flash Foxy festival offers clinics, workshops, parties, giveaways and a safe space for beginner climbers to come and learn more about all that climbing has to offer! Learn more, climb more, laugh more and love a lot. Registration opens soon. Check this link often.